Students from the supply chain management program at the C. T. Bauer College of Business participated in the first-ever FMC Technologies Project. 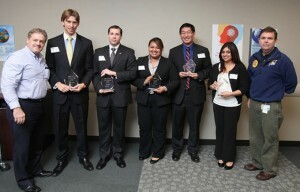 Pictured from left: Professor Victor Wayhan, first place winners Jason Cutbirth, Jacob Sarfati, Glenda Renderos, Anthony Huang, and Sadaf Dadwani, and Jerry Randall, FMC Technologies regional procurement manager. Supply chain management students in the C.T. 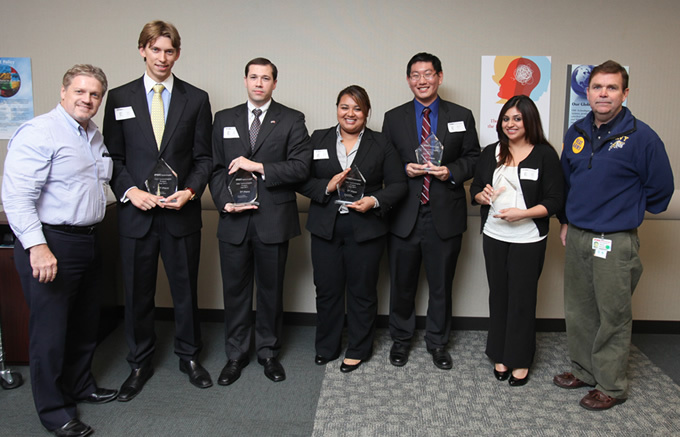 Bauer College of Business at the University of Houston put the lessons they learned in the classroom to the test during a semester-long case competition with FMC Technologies, a Houston-based company that provides technology solutions to the global energy industry. In the fall, the supply chain management program within the college’s Department of Decision & Information Sciences marked the first-ever installment of the FMC Technologies Project, a case competition that will be held during the fall and summer semesters. Allowing students to connect what they’re learning in a course to what businesses are doing is essential, said John Vercher, a 2011 graduate of the supply chain management program who is now a supply chain analyst at FMC Technologies. “It is very important for FMC Technologies and Bauer to maintain a strong connection. The curriculum within the supply chain management program addresses the needs of today’s modern corporation, and consistently produces young professionals with the right knowledge, skills and abilities that FMC Technologies looks for to fill the ranks of our supply chain,” Supply Chain Analyst John Vercher said. Jacob Sarfati, left and Jason Cutbirth, right, help their team take home a first place prize during their presentation to FMC Technologies. A total of 26 teams comprised of 130 students participated in the inaugural competition, tasked with interpreting data to perform a make/buy analysis for series of parts that make up a portion of FMC’s Enhanced Vertical Deepwater Tree. The analysis was conducted while considering several variables, such as capacity utilization, core competencies, demand aggregation, strategic vulnerability, customer requirements and SQDC (safety, quality, delivery and cost). 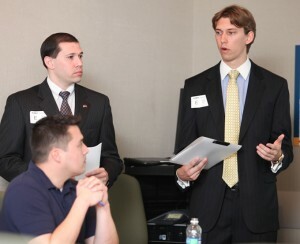 The teams then had to create and present a purchasing plan to several managers in FMC’s supply chain. Four teams were selected as finalists and moved on to the last round of competition, held at FMC Technologies’ Gears Road location, to present their plans to managers from Regional Procurement, Quality and Global divisions. The winning team included students Jason Cutbirth, Jacob Sarfati, Glenda Renderos, Anthony Huang and Sadaf Dadwani, who impressed judges with their concise, practical and thorough presentation and purchasing plan. Bringing together students of different knowledge, skills and abilities taught competitors how to work together in a team and draw upon each other’s strengths to form a finished product, said FMC category manager Lori Johnson. Opportunities like this give students the chance to extend their learning beyond the classroom setting, Johnson said. “We believe that the most important experience gained from participating in this project is that it will give the students a chance to take the body of knowledge gained from their years in the Supply Chain Program apply it to a real world project — to bridge the gap if you will, between theory and practical application,” she added.